Belfast Shire (1863-1994) was a municipality in western Victoria centred around Port Fairy. Its name was inspired by Port Fairy's original name, which was in turn inspired by Belfast, Ireland. Port Fairy (Belfast) was a privately surveyed township, owned in the main by James Atkinson who held a Special Survey site of eight square miles adjoining the coastline. Atkinson was born in Ireland. Port Fairy was an early township in western Victoria, and settlement tended to spread inland from there. The Belfast Road district was proclaimed in 1853 (the first outside Melbourne) and extended northwards nearly to Penshurst. It also included Koroit. On 29 June 1863 Belfast Road district became Belfast Shire and in 1871 its northern part was severed and became Minhamite Shire. 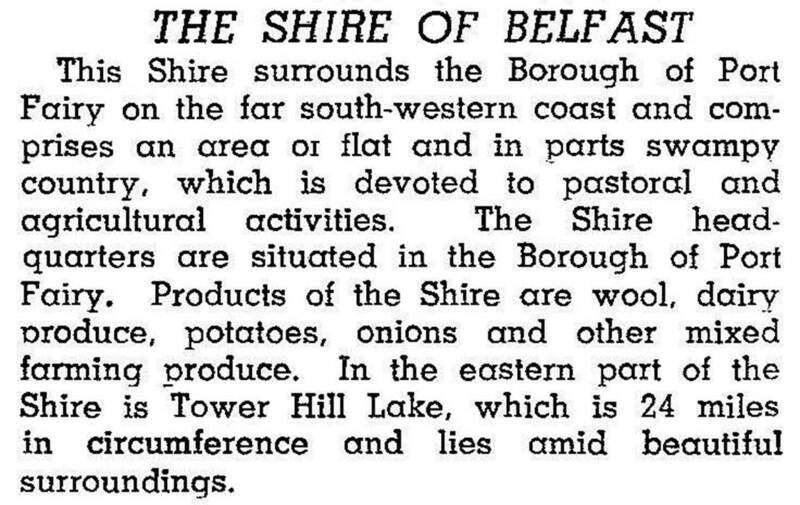 The former Belfast Shire was reduced in area by about 70% resulting in the shire having 519 square kilometres. Its eastern boundary was Tower Hill and Koroit, and its western boundary was a narrow coastal tongue beyond Yambuk (which was the shire's largest village). Other villages included Crossley, Killarney and Kirkstall. The shire offices were in Port Fairy, which was a separate municipality. A railway line ran to Port Fairy (1890-1977), and the Princes Highway followed the coast a few kilometres inland. The shire's eastern area was noted for fertile volcanic soil from the Tower Hill lava flows, which were intensively used for dairying, and potato, onion and wheat growing. General grazing occupied the northern and western parts. Most of the villages had a significant Irish Catholic population, and there were Catholic schools at Crossley and Kirkstall (in addition to Koroit and Port Fairy). Irish traditions continue. In 1994 farming occupied 92% of Belfast Shire's area. Grazing comprised 90,750 sheep and lambs, 25,700 meat cattle and 20,000 dairy cattle. The potato harvest was 4456 tonnes. On 23 September 1994, Belfast Shire was united with Port Fairy borough, Minhamite Shire, most of Mortlake and Warrnambool Shires and part of Dundas and Mount Rouse Shires to become Moyne Shire.